When your child is in the throes of drug addiction, you do everything you can to help, just like Cathy Fennelly did for her son battling a heroin addiction. She emptied her 401k, sold her jewelry and sobbed every night that he slept cold on the streets. After 8 years, Cathy opened her front door one morning to find his lifeless body on her front porch. Her grief was catastrophic, complex and, above all, constant. Drug overdose is the leading cause of accidental death in the United States. In 2015, more than 50,000 Americans died from lethal drug overdoses, with an overwhelming 61 percent resulting from the sweeping opioid addiction epidemic plaguing the United States. In 2015, almost 300,000 Americans between the ages of 12 and 17 were using opioid prescriptions that were not prescribed to them by doctors, and 21,000 adolescents and young adults used heroin at least once in the last year. Both prescriptions and illegal drugs contribute to the opioid epidemic. Those numbers are terrifying and devastating, and a warning sign for an even greater tragedy — the death of a child due to drug overdose. Surprisingly, though 46 people die from drug addiction every day, many parents find the stigma so intrusive that there is little support for dealing with this type of grief. 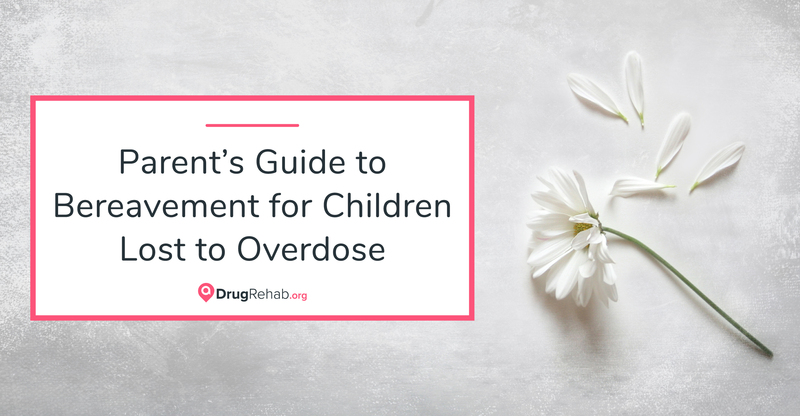 The grief of a parent of someone who dies by overdose is unlike any pain there is. First, there is the sadness of the loss of a loved one, but that can often be overcome with guilt for not being able to save your child. On top of that, society tends to judge a substance-abuse related death more harshly, which can cause a surviving loved one to feel isolated, even in public places. Join a support group, whether in-person or online, for grieving parents who have lost a child to drugs or alcohol, such as GRASP, Compassionate Friends or Bereavement Parents of the USA. Pick up a book on bereavement to become informed, enlightened and supported by similar situations and a sense of community. Find a grief counselor or therapist who you are comfortable opening up to and discussing your emotions with truthfully and honestly. Look for one who has specific qualifications in the emotions you are feeling and the situation you are facing. Keep a journal of your emotional journey. Ask yourself, how am I feeling today? What are the major emotions I’m working through? Am I learning anything about myself? How am I growing today? Grief is a process, but dealing with the emotions of losing of a child to drugs or alcohol can make that journey more complicated. You may experience denial, anger, betrayal, depression, guilt and many other jarring emotions. Be sure to make healthy decisions to cope — if you want to withdraw from social activities, motivate yourself to get out in comfortable settings. Exercise more or volunteer for an organization that brings some meaning to your day. Drug addiction isn’t something you are; it is something you have. Drug addiction often begins with some kind of trauma, and the person addicted could have been prescribed medication that they became addicted to, or sought to cope on their own with illicit drugs and/or alcohol. Keep the conversation going; don’t just chat about it once and think it will all be fine. Try not to assign blame or use language that conveys the deceased is at fault. Give them space to be honest about the way they feel without feeling judgment. Be honest, but simple, in your explanations, and don’t avoid any of their questions, no matter how much the answers might hurt you both. Teach them simple, judgment-free words that they can use to explain the death to their friends, classmates, coworkers, bosses, coaches and teachers. You may find that by being intentional about how you help friends and family better understand the situation can help heal your own wounds as well. In 2012, there were an estimated 2.1 million people in the United States who suffered from substance use disorders related to prescription opioid pain relievers, and an estimated 467,000 addicted to heroin. These opioid dependencies often start in an unlikely place — a doctor’s office. In 1991, doctors prescribed an average of 76 million opioid prescriptions, like oxycontin and hydrocodone. That number skyrocketed to nearly 207 million in 2013. These aren’t people who fit into any stereotype of addiction. They are our neighbors, coworkers, friends … and children. Dealing with this painful reality is excruciating for a parent who has lost a child to substance abuse or an overdose. You may be inclined to avoid having a funeral or memorial because of the harsh criticism of your family or neighbors. You may feel like you failed as a parent; that you are the ultimate cause of your child’s death — if only you had been better. Grief is difficult enough, but combined with these painful thoughts, parents of children who have died from drugs or alcohol can feel isolated and ostracized. Birthdays, holidays, anniversaries and other special occasions arise. It’s time to organize, clean or store your loved one’s possessions. Resolving financial and legal matters. Paying attention to how this death is impacting your other relationships — marriage, children, work — and committing yourself to healthy, honest communication. Feeling overwhelmed by breaking every task down into small, manageable steps. The pain becomes too much; try to focus on the positive, happy memories. Most importantly, allow yourself to say goodbye — when you’re ready. So many parents feel they must let the stigma of drug abuse overshadow the loss of a precious life. Take a vacation to your son or daughter’s favorite place, plant a tree or do something life-giving in their memory and stop looking for what you did wrong. Instead, remember all of the wonderful memories associated with what you did right.